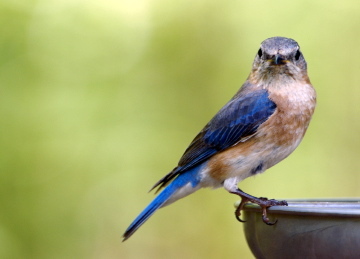 In order to entice bluebirds, sometimes their very favorite food must be offered. 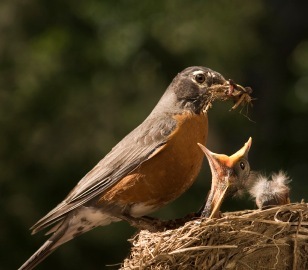 And meal worms happen to be what’s on the menu over here. 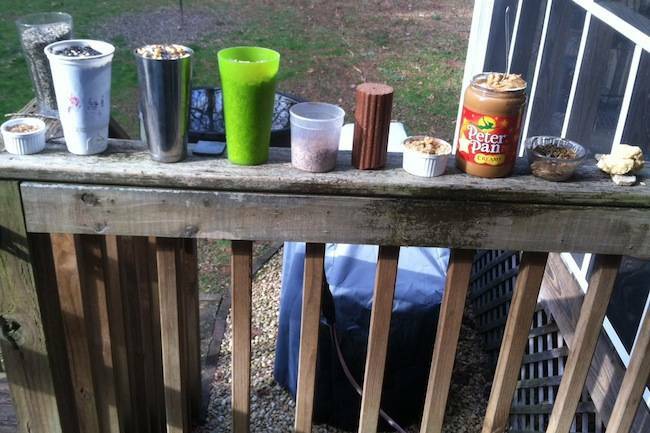 Live mealworms are best, but dried or roasted ones will also work. 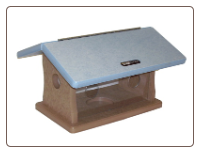 One of the problems is that many species really enjoy mealworms, and you can find your supply dwindling quickly if fed in an open tray-type or dish feeder. 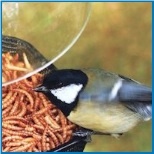 Live mealworms are available in bulk quantities should this become habit forming too. They’re simple to store…just place in in a container in your fridge. Air holes are needed, but the worms stay in a dormant state until warmed up by the sun or room temperatures. 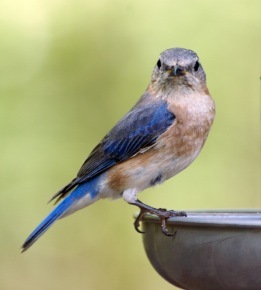 A mealworm feeder that’s made especially for bluebirds is one that is enclosed, in fact they’re called Bluebird Feeders. Consisting of two, four, or sometimes six entrances, they have clear acrylic panels for closures, and they’re meant for bluebirds only. 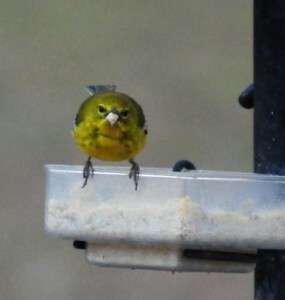 Some feeders have a dish in the center for the worms, while others have a recessed circle for them. 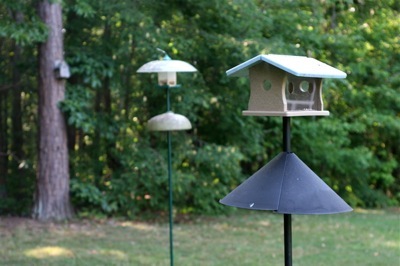 The birds must fly into the feeder to retrieve the worms, and very few species will try this. 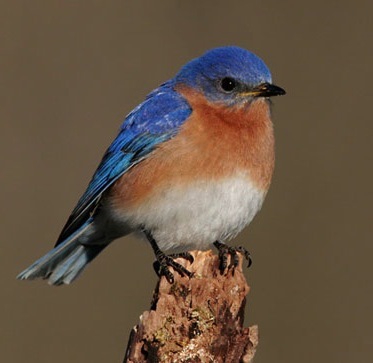 But somehow, the natural instinct of bluebirds tells them to do so. It’s amazing to watch, especially when parent bring babies over at feeding time. At first the chicks don’t understand how to get inside, but they learn quickly. 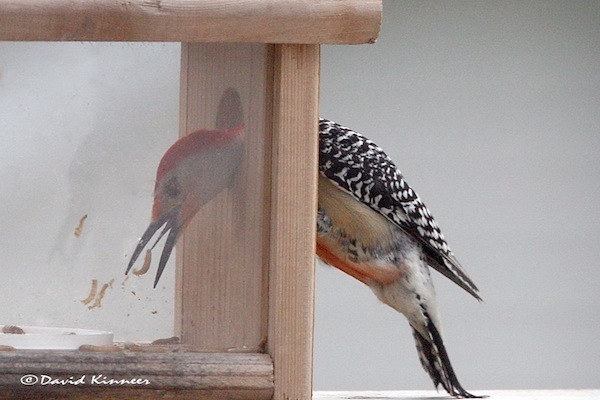 And once they learn how to get the food, they frequent the feeder often. 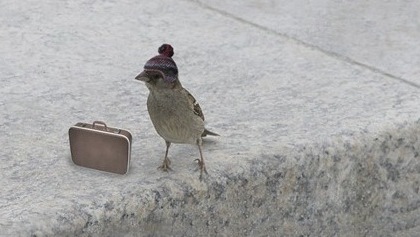 This has got to be one of the best scenes of backyard birding! 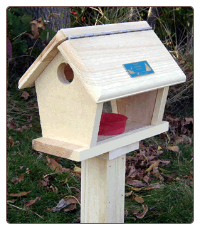 Available in standard wooden models, mealworm feeders also come in recycled plastic versions. 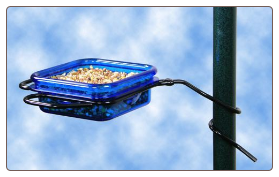 The advantage with recycled plastic is that the feeder will never crack, split, or rot like wood tends to do over the years. Also keeping plastics out of landfills is huge plus to the environment. Now I wish the nasty starling who tried to shove himself through one of the entrances would’ve gotten stuck there!